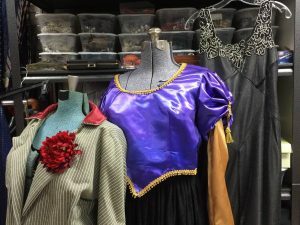 Certainly one of the most challenging and interesting aspects of designing costumes for a show is creating a look that is appropriate to the era in which the story takes place. Most scripts specify the time (sometimes the exact year, sometimes just a decade) when the action occurs. Sometimes the director has his or her own idea for the era they want to use. Most designers have some eras with which they feel the most comfortable. For those shows, not a lot of research is involved. For example, I have a pretty easy time envisioning the look of the 1950s and 1960s, probably because I grew up in that era. I can close my eyes and see what the clothes looked like back then, and this makes it easier to find suitable costumes for shows that take place at that time. Other decades…or centuries, for that matter…take research to understand. Women’s silhouettes, for instance, have changed drastically over time. Appropriate accessories, types of fabrics, sometimes even color choices need to be understood in order to create the proper mood on stage. In the past year or so I’ve designed a number of shows that took place in the Victorian era, a time I knew little about until I started researching it. Fortunately for me (and other designers, I’m sure! ), it’s now pretty easy to Google “1890s women’s evening wear” or any other topic and get hundreds of images to start my research. I usually also seek out articles that explain more about the do’s and do not’s of fashion at that time, mainly because an online image search can just as easily lead to inaccurate examples as it can to accurate ones. On rare occasions, a play or musical will cover a span of more than one time period, whether by chronological action (as THE DIXIE SWIM CLUB will do later this season) or by other theatrical devices. In the case of MOON OVER BUFFALO, there are two plays that take place within the play itself. The actual time period of the play is post-WWII, so the day-to-day costumes need to evoke a 1940s/50s feel. But embedded within the play there are two completely different eras as well. Some of the characters become actors in a scene from CYRANO DE BERGERAC, which takes place in the 1600s, and some are in a scene from PRIVATE LIVES which calls for 1920s evening wear. In other words, this show has taken a whole lot of research on my part to figure out how to portray those three eras with some degree of accuracy so that they each evoke a certain “feel”. Make plans to come see MOON OVER BUFFALO to see if I’ve been able to pull it off!